6:15 min. 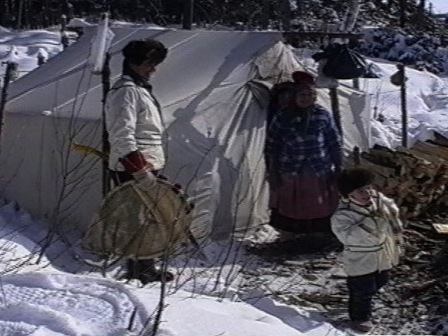 - Messenak receives his first pair of snowshoes from Nukum, his great-grandmother: this first pair of snowshoes will bring him to the way of the Innu hunter. But learning is not as easy as one might think. That is why Nukum has invited Messenak to come and visit her. Messenak - Do you think he really wanted to tell me something? Zacharie Bellefleur - I'm not sure... It's said that Metshu is the wise one, the one who sees beyond, who understands. You said he spoke to you in your dream... Perhaps you have questions within you to which he has the answer. Messenak - Why was Nukum in my dream? Zacharie Bellefleur - Nukum is one of the old ones, an elder among the women in your family, your great grandmother... She has a lot to give you... Maybe Metshu wanted to tell you that she too has answers to your questions.